This study proposes a theoretical framework for understanding how and why certain memes prevail as a form of political discourse online. Since memes are constantly changing as they spread, drawing inferences from a population of memes as concrete digital artifacts is a pressing challenge for researchers. This article argues that meme selection and mutation are driven by a cooperative combination of three types of communication logic: wasteful play online, social media political expression, and cultural evolution. 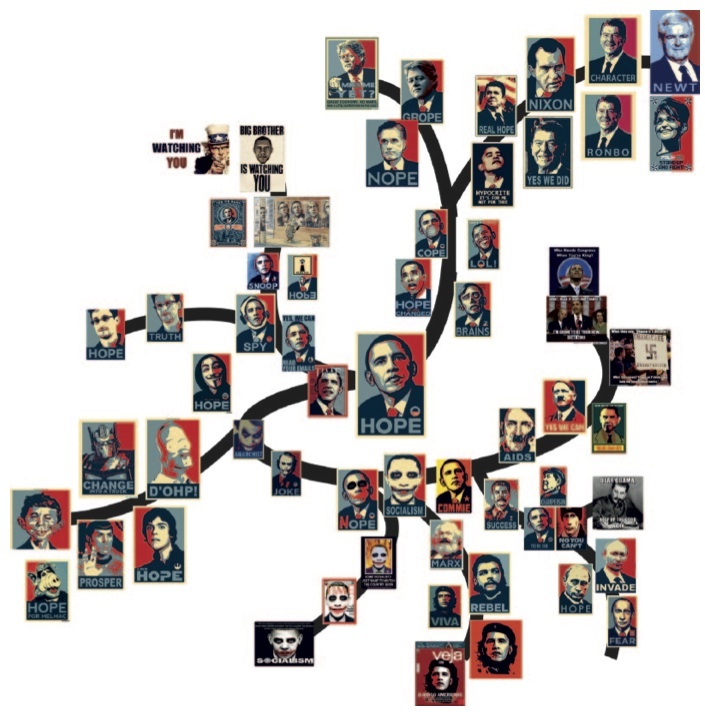 To illustrate this concept, we map Shepard Fairey’s Obama Hope Poster as it spreads online. Employing structural rhetorical analysis, the study categorizes Internet memes on branching diagrams as they evolve. We argue that mapping these variations is a useful tool for organizing memes as an expression of the values and preferences embedded in online communities. The study adds to the growing literature around the subversive nature of memetic diffusion in popular and political culture. What we do not address in the article is that, at least in Europe, many memes violate copyright law, making it also a prime example of the contradictions of popular remix culture. Please check out a self-archived full text version of the article “Memes as Games: The Evolution of a Digital Discourse Online“.